How do you envision the East Harlem Waterfront? 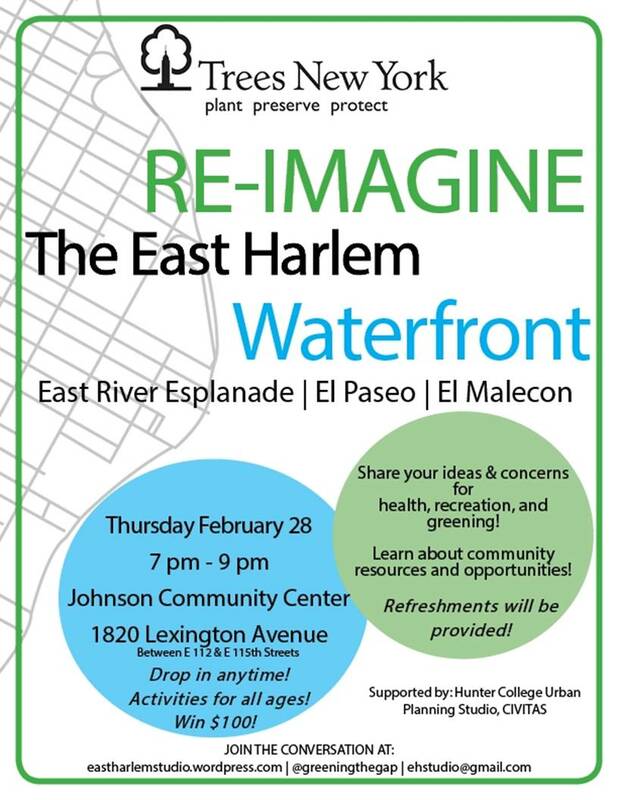 Please stop by and share your ideas and learn about community resources and opportunities for the East River Esplanade/El Paseo/El Malecon, on Thursday, February 28th at the Johnson Community Center. Refreshments will be provided. WHEN: Thursday, February 28, 2013. 7 PM – 9 PM. WIN $100– Do you live or work in East Harlem? Please complete this survey to share your opinion about the East Harlem waterfront, and to be entered into a drawing to win a $100 prize. This entry was posted in Blog, East Harlem, Events and tagged CIVITAS, East River Esplanade, El Malecon, El Paseo, green, greening, GreeningTheGap, health, plant, recreation, Trees New York. Bookmark the permalink.